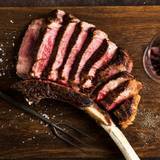 Black Hide by Gambaro at Treasury Brisbane will enchant and entertain guests by showcasing one of the most extensive selections of world-class Australian Wagyu and Angus steak cuts as the hero cuisine, mouth-watering seafood dishes, and a wide choice of tantalising share plates. Overlooking the Brisbane River and within an easy stroll of the city’s arts and cultural South Bank precinct, this stunning restaurant will provide exceptional personalised guest service, and a divinely rich atmosphere that can only be delivered by blending intricate and cutting-edge design with worldly charm and sophistication. If you’d prefer to talk now, please call us at (07) 3306 8420.